Were you bad girl (or boy) this summer and skipped your face sunscreen more than a few times? 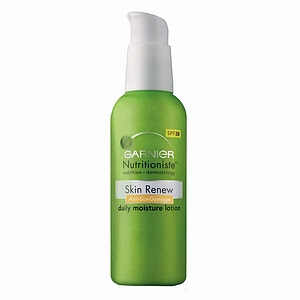 Well Garnier's Nutritioniste Skin Renew Anti Sun-Damage Daily Moisture Lotion is a wonderful, reasonably priced moisturizer from their Nutritioniste line that actually helps protect future sun damage, contains an SPF of 25 and repairs some of the sun damage already done. Well Garnier met the challenge by creating a product that goes on very light and smooth with no greasy or waxy feel from the sunscreen. (I found I got my best results by using a thin layer first and then applying more when needed.) They was also no grey or white residue on my skin. It absorbed easily into my skin and I loved the fresh, light and slightly floral scent. The pump packaging is perfect for travel and your gym bag as well.